What if America’s most powerful leader was also its prime target? Vince Flynn’s shattering thriller, Term Limits, soared onto national bestseller lists and marked the emergence of a new master of political fiction in the same league as Tom Clancy. In USA Today, Larry King called Term Limits a page-turning read, while critics and readers nationwide praised its riveting premise of Washington under siege — a scenario made chillingly real by this superb storyteller. 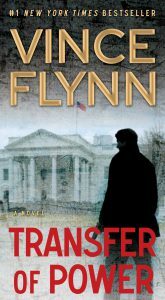 Now, Flynn infiltrates America’s power structure at its very core, in a new novel that places the president of the United States in the direct line of terrorist fire. On a busy Washington morning, amid the shuffle of tourists and the brisk rush of government officials, the stately calm of the White House is shattered in a hail of gunfire. A group of terrorists has descended on the Executive Mansion, and gained access by means of a violent massacre that has left dozens of innocent bystanders murdered. Through the quick actions of the Secret Service, the president is evacuated to his underground bunker, but not before almost one hundred hostages are taken. While the politicians and the military leaders argue over how to negotiate with the terrorists, one man is sent in to break through the barrage of panicked responses and political agendas surrounding the chaotic crisis. Mitch Rapp, the CIA’s top counterterrorism operative, makes his way into the White House and soon discovers that the president is not as safe as Washington’s power elite had thought. Moving stealthily among the corridors and secret passageways of the White House, stepping terrifyingly close to the enemy, Rapp scrambles to save the hostages before the terrorists can extract the president from the safety of his bunker. In a race against time, Rapp makes a chilling discovery that could rock Washington to its core: someone within his own government is maneuvering in hopes that his rescue attempt will fail. With the crackling tension and explosive action that made Term Limits a roller-coaster, edge-of-your-seat thriller (Minneapolis Star-Tribune), Vince Flynn delivers Transfer of Power — a blockbuster novel that carries us just beyond today’s headlines.